Zlatan Ibrahimovic signed his first professional contract in 1996 with Malmö FF at an age of 15. He then played for the junior team for a while before beeing moved up to the senior side for the 1999 season of the Swedish top league Allsvenskan. Zlatan Ibrahimovic played a total of 6 games and scored one goal. 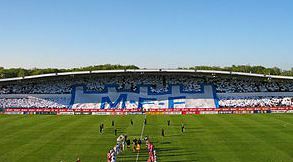 During that season Malmö FF finished in 13th position in the league and were relegated to the second division “Superettan”. In Superettan Zlatan really grew as a player and played a total of 26 games in the league during that season and scored a total of 12 goals. Zlatan Ibrahimovic also played 2 games in cups and scored 1 goal. Zlatan Ibrahimovic was one of the main contributors to get Malmö FF back to Allsvenskan again. During this season there was interest from Arsene Wenger to sign Zlatan Ibrahimovic to Arsenal but Zlatan decided to stay in Malmö FF instead. In the season of 2001 Zlatan and Malmö FF were playing in Allsvenskan and Zlatan played a total of 8 games and scored 3 goals before he signed with Ajax. The signing of Zlatan Ibrahimovic to Ajax was announced in July and the deal was worth 80 million Swedish kronor and additional bonuses on additional sales in the future. This money was the biggest sale that Malmö FF or any other club had done in Sweden. With the money from the sale of Zlatan Ibrahimovic Malmö FF was able to build up one of the top clubs in Sweden. Even untill today Zlatan Ibrahimovic and his girlfriend Helena Seger have a strong connection to the city of Malmö as they own a house there and also spend some time there on a regular basis. The fans in Malmö FF hope that Zlatan Ibrahimovic some day will move back to Malmö and end his career with one season in his original club.